Novation launched the original Bass Station in 1993 and it became an instant favourite. Its digital oscillators and analogue filter defined countless dance and electronic hits of the 1990s. 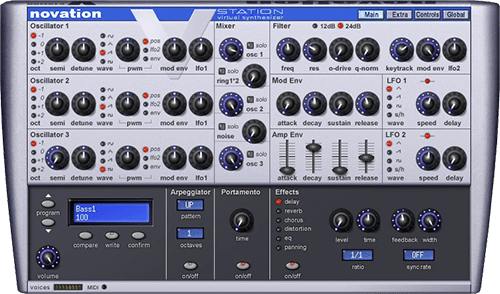 The V-Station is a polyphonic soft-synth for Mac and PC. It has the same real 3-oscillator flexibility as the award winning K-Station, with powerful filters, 8-voice polyphony, simultaneous Novation FX.